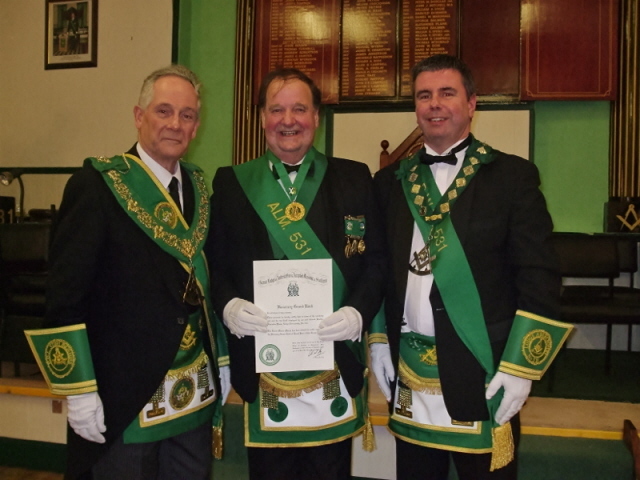 Congratulations to Provincial's Latest Honorary Grand Office Bearer. Brother Alexander Plank P.M. Lodge Abercromby No. 531, Past Senior Provincial Grand Warden, was presented with the Honorary Grand Rank of Bard by the Right Worshipful Provincial Grand Master, Brother Andrew A. McKinnon at the Regular Meeting held in Lodge Abercromby No. 531 on Tuesday 10 January 2012. Honorary Grand Rank is presented to Sandy in recognition of his services not only to his own Lodge, Lodge Abercromby, to Provincial Grand Lodge but also to Freemasonry in general. In the photograph is RWPGM, Brother Andrew A. McKinnon, Brother Alexander Plank PM and Brother Iain McMillan Right Worshipful Master of Lodge Abercromby.